As a team of creatives with a growing reputation for beautifully effective® design in all other arenas, we know that practicing what we preach is no small challenge. Usually the Christmas card creation process begins in July with a brainstorming session. We lock our most creative minds in one room and play Christmas music on repeat until one of them has a Eureka! moment mid-Mariah Carey. Although we had a plethora of jingle-clad ideas, we were enchanted by the delicate flourishes and sweeping strokes of calligraphy which perfectly personify the magic of Christmas. With an appetite to create something a little different, we set out to juxtapose this traditional, elegant art with a zingy and unconventional finish. Brief in hand, we searched for a few talented partners to help bring our concept to life. 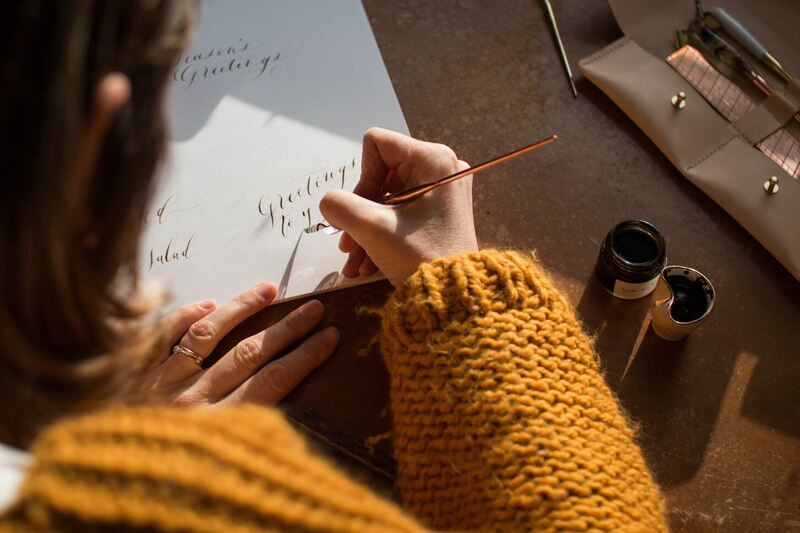 After pouring through the Instagram feeds of many talented artists we settled on locally-based calligrapher Gemma Milly and craftsman Tom Gyr (a talented husband and wife duo). Tom, founder of Tom’s Studio, crafts stunning and unique calligraphy pens. Each nib holder is made using a 1950s Myford engineering metal lathe, with carefully-chosen materials selected for their mesmerising aesthetics. We tasked Tom and Gemma with transforming our Christmas message into cool and cosy calligraphy and, with one of Tom’s pens in hand, Gemma did just that. Her signature hand lettering style embellished the page, romanticising our words with a delicate elegance. To complement the final artwork we chose a vibrant colour palette. Partnering with the talented folk at Dayfold we paired G.F. Smith’s pale grey Colorplan paper with an appropriately fluorescent yellow foil and a sculpted emboss. The result is a product of a convivial collaboration that is intended to be both graceful and bold.